So proud of Urukundo staff and volunteer Amy Dove! Here’s the first adult English as a second language class -- with certificates to prove it. Juliette (human resources), Chantal (day care supervisor), Ismail (dental receptionist) and Libby (manager for cleaners). Good job; well done all. Thank you, Amy. Xavier (driver), Chantal (cleaner), Florida (cleaner), Amy, Adelphine (mama), Francoise (mama), Libereta (cleaner), Clarisse (day care) and Josephine (day care). 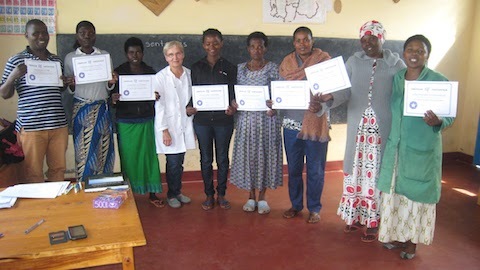 We thank Amy Dove, Sewing Center students and Sewing Center teachers (Therese, Redumptus and Desire) for their participation in English class and finishing the first module of 30 hours in their curriculum.